During the summer, Dr. Melanie-Angela Neuilly spent six weeks conducting field ethnographic research at the Institut Médico-Legal (or medical examiner’s office) in Nice, France. This research project was funded through a WSU Seed Grant, and fits within Dr. Neuilly’s larger research interest pertaining to the variations in medico-legal practices in France and the United States. Prior to this summer’s trip, Dr. Neuilly had studied another medico-legal institute in France, as well as two in the United States. During this summer’s research, Dr. Neuilly conducted observations of autopsies, as well as daily operations at the Institut Médico-Legal, and extracted qualitative and quantitative data from autopsy report files. The Institut Médico-Legal in Nice ranks among the largest in France, investigating roughly 300 deaths per year. 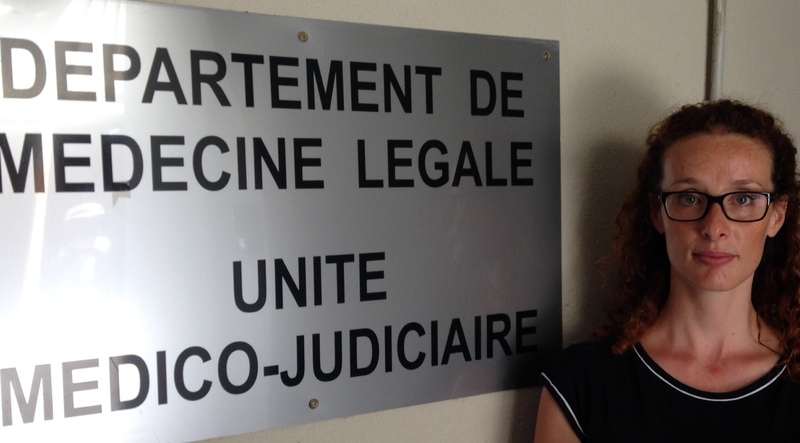 It thus provides an interesting contrast with the Institut Médico-Legal in Rennes, the other French site she has studied so far, which investigated under 100 deaths a year. It is also quite different from the two American sites, one of which was located in a densely populated urban area of the Northeast, and investigated around 2,000 deaths a year, while the other, in Ada County, Idaho (where Boise is located) investigated around 200 cases a year. While the two American sites are different from each other because one is a medical examiner’s office and the other a coroner’s office, the French sites differ from their transatlantic counterparts in that they also investigate the injuries incurred by victims of crimes as well as accidents in order to establish the corresponding punitive damages and restitution. Other preliminary findings include some legal differences in the process leading to autopsies. While the role of the medical examiner or coroner tends to be defined in state statutes, giving them jurisdiction over certain types of deaths, their involvement in France is contingent upon subpoena by the prosecutor on a case-by-case basis. Dr. Neuilly’s research aims at establishing the full range of variations between medico-legal practices in order to better contextualize their aggregated results – vital statistics at the local and international level – and thus provide a more valid and reliable basis to our understanding of violent deaths.